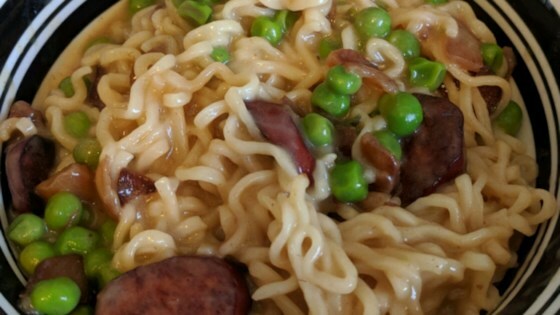 "Ramen noodles tossed with a sauce of turkey sausage, peas and sour cream.This is a great and inexpensive recipe that really perks up the taste of good old ramen noodles!" In a large skillet, warm oil over medium heat and saute sausage and onion for 10 minutes. Meanwhile, bring a large pot of water to a boil. In a small bowl, whisk together 2 seasoning packets from ramen noodles, flour and water until smooth; add this sauce and peas to skillet. Bring mixture to a boil, cover and cook for 5 minutes or until heated through. Add noodles to large pot of boiling water and cook for 3 minutes; drain. Remove sausage mixture from heat and stir in sour cream; do not boil. Mix in noodles and serve. See how to make this savory breakfast casserole. What a yummy, quick, filling dinner! I used one packet of spicy Ramen flavor along w/ one packet of chicken, omitted the onion, & used mixed veggies instead of just peas. MMMM! This was okay, but not something I would make very often. I didnt have an onion so I used 1/4 cup dry onion. It tasted so good! My whole family loved it. AWESOME!!!!!!! EASY!!!! Kids loved it-I loved it. A definate winner!! A++++++ Thank-you!!!! My husband didn't really like it, but my kids gobbled it up. Will just have to make it when he's gone! We really enjoyed this. Next time I would cut back on the noodles, though.